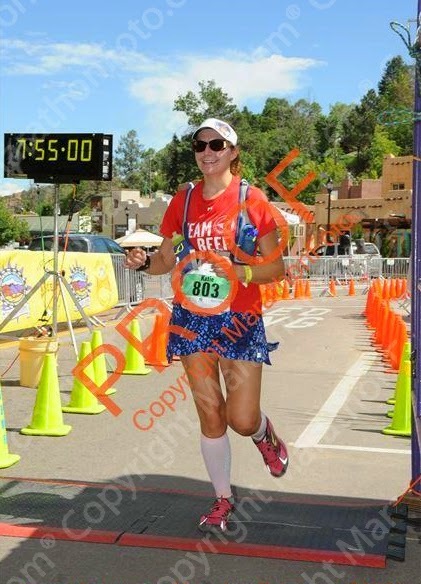 Pikes Peak Marathon: ranked #2 on Weather.com's list of the Toughest Marathon's in the world...and I did it!!!!!!! Me!? 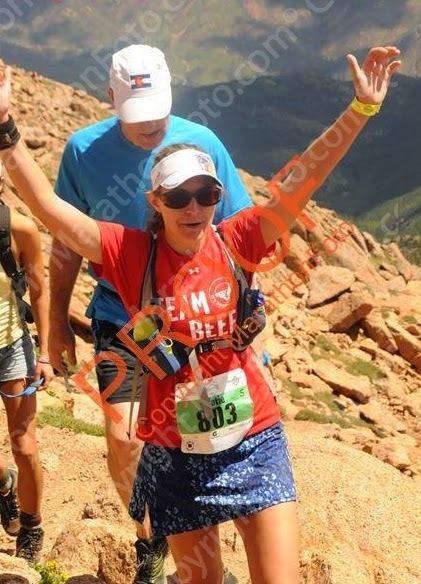 The chubby girl who couldn't even run a mile a few years ago - let alone up a fourteener!!! I'll be honest though, it was a LONG day. The week leading up to the marathon had me a little nervous. I had a weird dream the weekend before that I went down the wrong trail and was going to get disqualified. 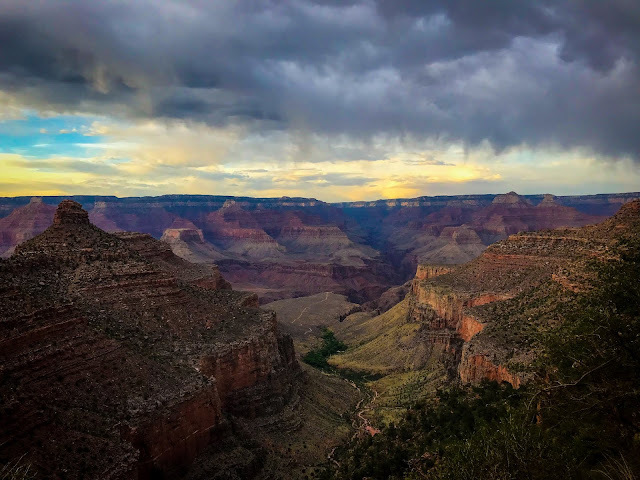 Then on Wednesday I went for a "calm the nerves" run on what is normally a beautiful, fairly easy trail run - Serpent's Trail in the Colorado National Monument, and ended up in a huge downpour afraid I was going to get struck by lightning. Saturday, I went for my last "shake-out run" and ended up running into a Coyote (I didn't literally run "into" it - but came across it). Then Saturday night after packet pick-up, I went to check into my hotel and they had given away my room (still upset about this - seriously - NEVER stay at the Manitou Inn and Suites at Pikes Peak - worst hotel ever)!!! So needless to say, I felt like I had a bad omen over me surrounding this race. After the hotel ordeal (which worked out okay - my parents had a room and my dad let me sleep on the bed with my mom and he slept on the floor - so thank you!!! ), my mom and I went to Safeway so I could get a bagel for breakfast the next morning and as we were coming back into Manitou Springs, there was a gorgeous sunset over Pikes Peak. I decided to take it as a sign that all of the crazyness had passed, and now I could rest up and have a good race the next morning! My picture doesn't do the sunset justice! The race started at 7:00am on Sunday, so I woke up around 5:30 and made it to the starting line around 6:30. 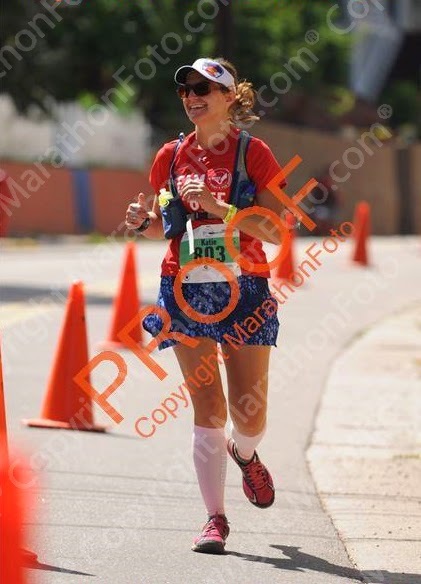 After joining some group photos (Marathon Maniacs and Team Beef), I circled through the porta-potty line, then saw my parents for a few minutes before making my way into the crowd at the start line. Even though there are two waves (I was in the slower wave), they don't actually separate them. They just tell people in wave 1 to stand towards the front, and wave 2 towards the back. So I found a spot at what I hoped was the beginning portion of the wave 2 runners (it's hard to pass once you get onto the trail - so I wanted to make sure I wasn't too far back). Selfie at the starting line! A few minutes before the start, a women sang "America The Beautiful" (which was inspired by the views from atop Pikes Peak), then Bart Yasso spoke for a bit, and then the gun went off! It was a clump of people until we crossed the starting line and we started running. The road section is a little over a mile until you get to a dirt road that leads to Barr Trail. 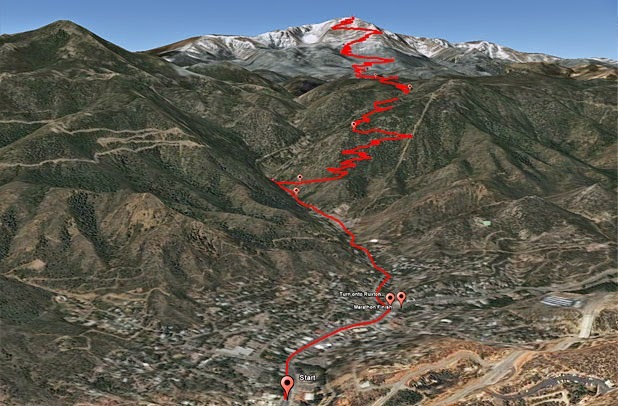 Once you get onto Barr Trail is where the first major steep section, "The W's" start. The combination of the steepness and the heat got to me quickly and I had a headache through this section. It had already been in the 60's when we started, and this section of the trail had the morning sun blaring down on us. Luckily once we got to the "No Name" aid station at mile 4.3 and an elevation of 8,800 feet (which was also the first aid station with food), we were more shaded and it cooled down a little bit, which was nice! In between this aid station and Barr Camp is where the trail gets a little more "runnable". It actually had a few sections of gentle downhill which was really nice. Despite this, the miles still seemed to take forever, and I found myself constantly wondering when we were going to reach Barr Camp. I think a lot of this was because when I did the ascent as a training run earlier this summer with Kellee, we were talking a lot and the time seemed to go by much faster (despite actually having a little bit longer of an ascent time). 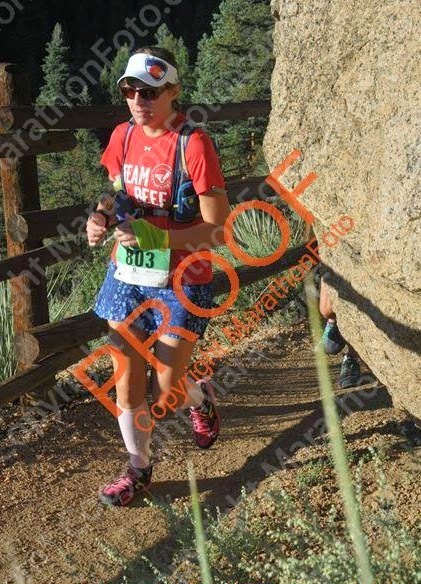 Eventually, I did finally reach Barr Camp (Mile 7.6 / 10,200 feet), which was a fun aid station! They had a lot of volunteers and cow bells and music! I grabbed some banana's and Gatorade before continuing on. The next aid station would be A-Frame in about another 2 1/2 miles. I continued on in the line (the is one thing about this race - you're pretty much single file following people for the ascent portion) until about another mile or so when we finally saw the first place runner coming back down! And man was he flying. I honestly can't believe how insanely FAST some people can run down mountains with rocks and roots and things in the way. I figured we would start seeing a lot more runners, but it actually took another mile or so before we started getting more. 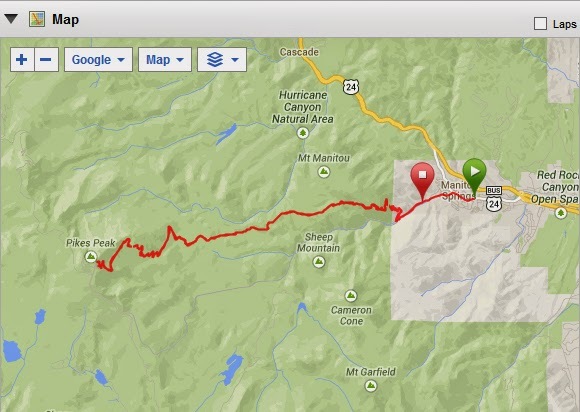 After several more LONG, SLOW miles, I finally reached A-Frame (10.2 miles / 11,950 feet)!!! Woohoo. A-Frame is the last aid station before you leave treeline (and then the miles get REALLY long). I had some Gatorade and grabbed a pack of Honey Stinger chews and kept on going (just keep swimming...just keep swimming :). One foot in front of the other. The Honey Stinger Chews didn't really go down that well and I felt nauseous for a bit - but I told myself to just keep moving and hopefully it would settle down. And it did after a bit. As usual, I always love getting above treeline. Pikes Peak is actually a really nice trail above treeline for a 14er - rocky, but there's still a pretty defined, sandy trail. I was keeping up with the same group of people for a bit which was fun - we were encouraging each other and letting each other know when more runners were coming down to make way. The closer we got to the summit, the more and more runners we had to let pass. We were moving so slow at this point, that at least it didn't really make much of a difference to have to let them by. With about 1 1/2 miles to the summit is the Cirque aid station (11.9 miles / 13,300 feet). I grabbed some pretzels and continued on. Up, up....move over and let people pass...up...let people pass...up, etc...SO SLOW.... Seriously though, this was the longest ever until FINALLY reaching the 16 Golden Steps!!! Woohoo!!! This seriously meant I was almost there. 32 switchbacks until reaching the top!!! Of course they're still incredibly slow, but it was that beam of light - I knew I was going to get there! There were a couple of tight spots on the trail, so we still had to get over a wait awhile, as by this point there were TONS of people coming back down. I know I look terrible in this - but I was so excited to see the summit sign!!! My parents rode up in the Cog Railroad and they took this! They had to leave before I made it to the top though. I just like how this photo shows all the views looking out over the plains. 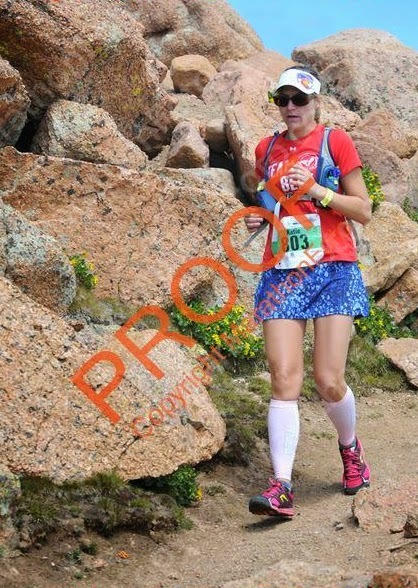 Despite reaching the top in all of its excitement...I was only half-way done with this race! So off I went - but this time at least I had gravity working in my favor! And now I got to the be the person with the "right-of-way" which was nice! The first mile back down was more of jog/walk since it's fairly technical, until passing the Cirque aid station when I really sped up until reaching A-Frame. I stopped at A-Frame for a minute and had grapes and cheez-it's (YUM!) before continuing on. Unfortunately, after the A-Frame station, the trail gets a bit more technical which made running fast a little difficult for me. I'm definitely a cautious runner on these sections, so I slowed down quite a bit from here until Barr Camp. Reaching Barr Camp was awesome. One thing that felt weird about this race is that you're so grouped together on the uphill and then on the downs everyone gets so spread out. So when I reached Barr Camp I was the only runner around - so as I got into the aid station, I literally had 5 or so different volunteers all asking me if I wanted what they had and saying my name (because it's on my bib). So I had, "Katie can I get you water," "Would you like some Gatorade, Katie?" "Katie - do you want some grapes?" etc, etc. It was weird...and the whole Kat-IE thing felt weird (it was on my bib though -because I always use my full name on these big races where they're really tight on security). So anyways, I got various food and drink from the aid station and and headed on out. Luckily, once I passed Barr Camp there were finally some more runnable sections again, so I was able to get my pace up a bit. With about 5 miles to go I started to feel some pain on the bottom of my heel. It felt hot - like I was getting a blister. Lovely - since every step I took put pressure on it! Ohwell, gotta keep going! So I kept going. I had been out FOREVER by this point, and I started counting down the miles. It helped to tell myself, "5 more miles, but only 4 until I reach the road (and so on)." I went through the last couple of aid stations and tried not to stop for too long. Finally I reached the W's. I was also starting to pass a lot of people that were just out hiking for the day - in a way this was reassuring because it meant I couldn't be THAT far. My heal was really starting to hurt by this point though, so my pace slowed pretty significantly going down the W's. On and on I went. Surely I would be off the trail soon? WHY WAS THIS TAKING SO LONG?! FINALLY I reached the junction where we leave Barr Trail and get onto a wider dirt road until the last aid station right before reaching the pavement. I have never been so relieved to see pavement. I didn't really actually want to run on hard pavement - it was more that I was using it a symbol that I was almost there! As soon as my feet hit the pavement, my heal BURNED in pain. I don't know why it made such a difference, but it did. I tried to run on the ball of the foot instead of the heal, but it just felt weird. I also knew I was getting really close to the 8 hour mark and I really wanted to finish under 8 hours - so I just powered through the pain. After all, I was going to have to get through it anyways - it might as well be sooner rather than later. As we got closer into town, there were more and more people out cheering. Finally, I saw Kellee and her group of friends! They all cheered me on which was fun and helped me push through the pain in my heel more easily. Shortly after passing them I saw my parents! I must be almost there!!! I turned the corner off of Ruxton street and was in the finisher's shoot! Almost there! And then...I did it!!! After almost eight hours of being out on my feet and covering almost 8000 feet of elevation gain plus another 8000 feet of loss - I was a PIKES PEAK MARATHON FINISHER! In 7:54:34. A little over 2 hours to spare. I have never been so excited to cross a finish line and get a finisher's medal! I knew it was going to be bad, but it looked WAY worse than I was expecting. Luckily they had a whole team of medical staff, so a nice lady helped me with it. She cut off the excess skin (after having to wet it down because it was all hardened - yuck!! ), then covered it with gauze. Once I got all situated, I headed out of the tent to catch up with my parents and get my finishers shirt and some pictures! In front of the finish line - with my battle wound all bandaged up! Weather: Sunny and HOT at the lower elevations, but nice at the top! Fun atmosphere - nice expo, the whole town seemed to be excited for it. My Nathan Hydration Pack - I only carried a small, 12oz bottle in the front that I refilled at aid stations, but had my rain jacket and a few layers in the backpack - the weather ended up being great and I never used any of my clothing layers, but it was reassuring to know they were there if needed! HOT!!! (I know this is probably better than it being really cold - but oh my goodness the miles at the beginning and end were so hot). So long and slow - haha not sure there's much that would help with this, but oh my goodness EVERY SINGLE mile felt SO long. 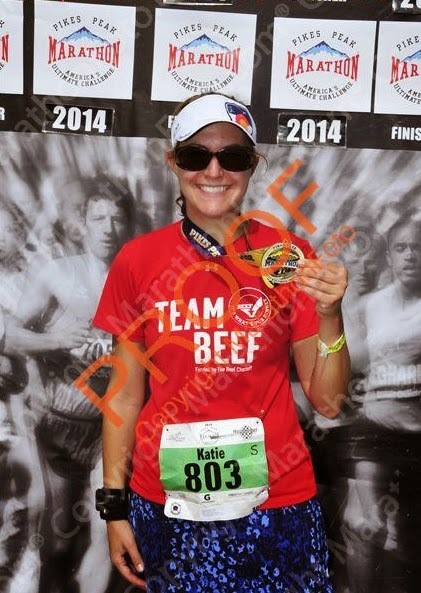 Overall, I definitely am glad I did this race. 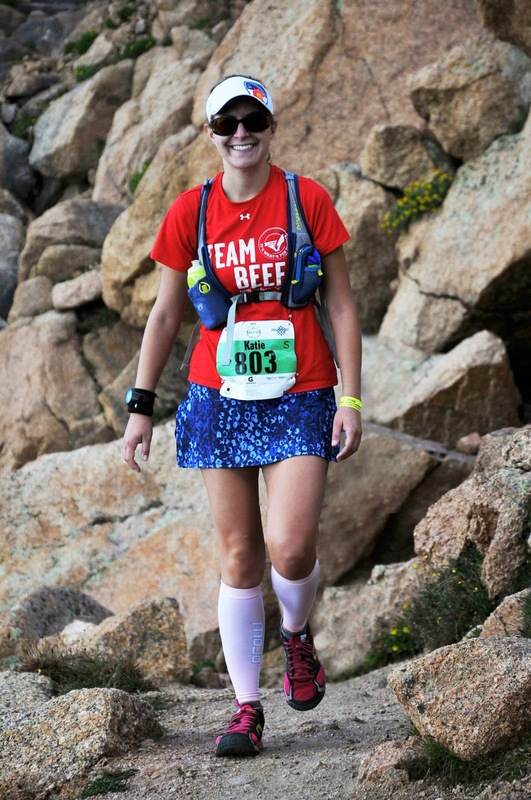 Even though I did the Leadville Trail Marathon back in June, which has similar conditions ("only" 6300 feet of gain though), this truly did feel a lot harder. I think just the CONSTANT up wears you out so much in the first half, that even though the second half is downhill, it still feels really difficult. I felt like I had energy for the first several miles back down, but after A-Frame, I was just ready to be done (and there's still 10 miles to go at that point). I do think it would be neat to do the "Double" someday (the Double is when you do the Ascent on Saturday AND the marathon on Sunday). But I'm definitely not making any immediate plans for that since right now the thought of doing this again is still not very appealing...in the slightest ;) - but it'll make a good addition to my bucket list! So, in conclusion, if you ever get the chance - I do recommend doing this race. Is it fun? Maybe at times, but honestly - not really. Is it beautiful? DEFINITELY! Will it teach you to persevere and push on despite being dead tired and in pain? DEFINITELY! And will it make you feel like a total bad a$$ when you finish? HECK YES!!!!! ROCKSTAR!!! 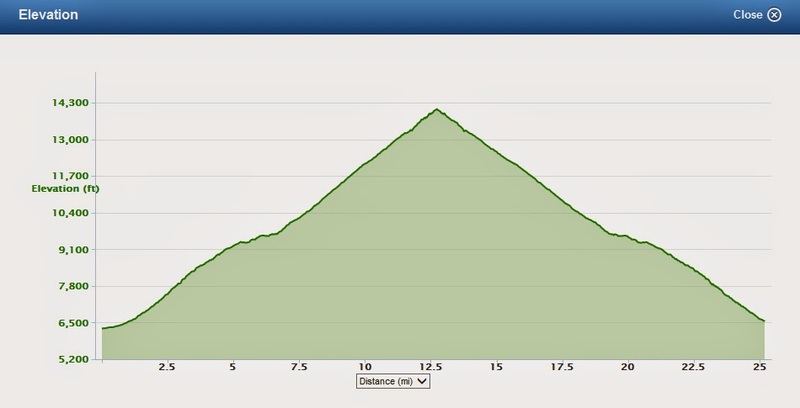 this race (even the ascent) is still too intimidating for me. Amazing!!! (I get so annoyed with hotels that give rooms away - what is the point of a reservation? It's like that Seinfeld episode). Anyway - glad it all worked out - congratulations!!! Have you seen that the Weather.com article has the Inca Trail Marathon that you did as #1 on the list of hardest marathons in the world - so if you did that, you could totally do Pikes!!! It does make for a LONG flippin day though!!! 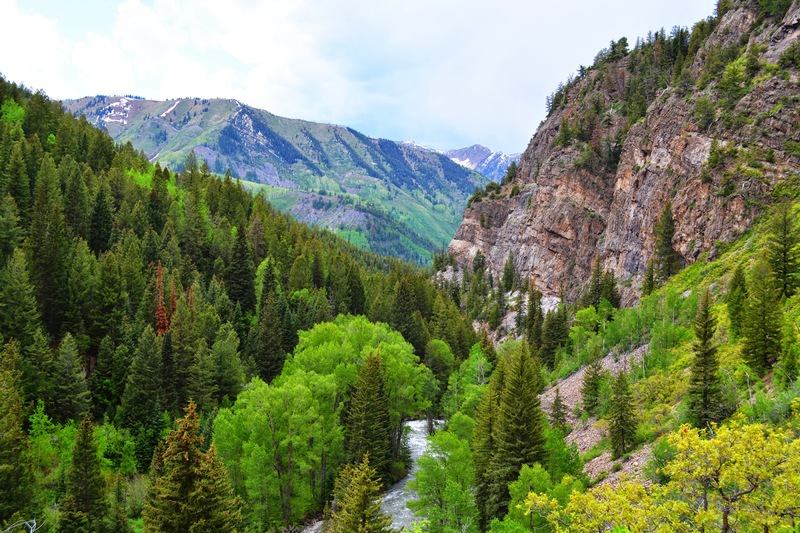 Where are you in Colorado? I live in Divide, 40 minutes west of CO Springs.